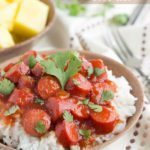 A simple, under 30 minute meal with hot dogs in a homemade sweet BBQ sauce served over white rice. Okay I admit, not the prettiest looking food. And it’s kind of weird right? But, oh my gosh. This dish is SO good. Oh, and if you have kids/grand-kids/nieces/nephews/little kids around? They are going to go wild for this. The babe could not shovel these in quick enough. He loved them. And by them, I mean the hot dogs. He’s not a huge rice fan quite yet. Mostly because he’s Mr. Independent and likes to feed himself. And rice isn’t super conducive for that. So the sticky chopped up hot dogs became his favorite. And one of my favorite messes to clean up so far. It was in his hair, his feet, and all over his clothes. Step aside bib. The baby knows his way around it! The “BBQ” sauce is slightly adapted from a favorite family recipe – my sister-in-laws. In fact, she helped my husband make it (the sauce but with chicken) for me when we were first dating. The husband passed it off as his own creation, but I’ve since learned his forte is combining cereal and milk OR boiling pasta noodles and mixing with spaghetti sauce. And that is one of my favorite things about him because I can make just about anything and he is super impressed and appreciative. But back to this sauce – it’s definitely a winner. A lip-smacking, finger-lickin’ delicious sauce. And with the hot dogs? Oh yes. This is a good one! Perfect for summer and to change up your next BBQ a bit. 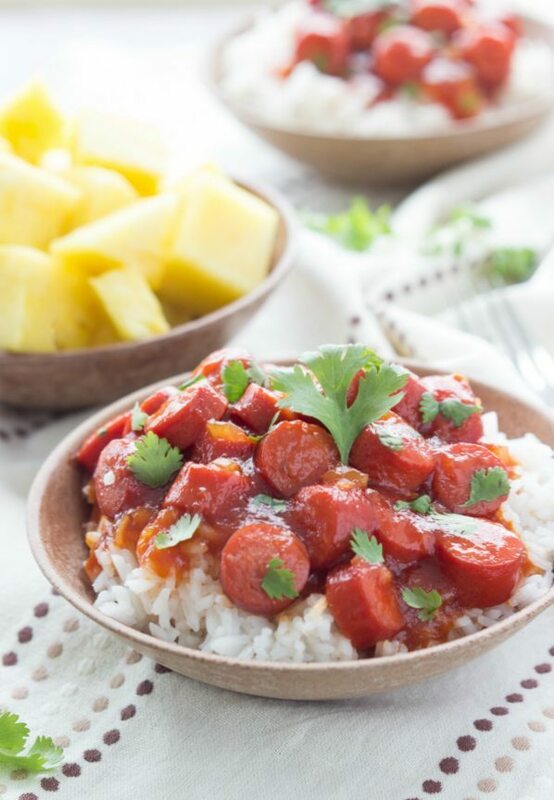 Who knew hot dogs without a bun could be this good?! When it’s summer my top picks of food – they pretty much revolve around what I can grill. The husband and I love grilling and we usually will do hot dogs or chicken skewers for Sunday Dinner. The little guy loves all the bites he can get. Cook the rice with the 2 cups water according to package directions. Meanwhile, chop the hot dogs into 1/2 inch coins. Add 1/2 tablespoon olive oil to a skillet and then add the hot dogs. Add the hot dogs and brown on both sides, about 4 minutes total. Remove the hot dog pieces onto a paper towel lined plate. Drab off any grease and set aside. In a large skillet combine the remaining 1 and 1/2 tablespoon olive oil with the onion. Cook until tender and translucent. Add in the ketchup and vinegar. Stir well. Add in the brown sugar, mustard, and Worchestershire sauce. Reduce the heat and allow to simmer for about ten minutes. Stir in the hot dogs. Add salt and pepper to taste. 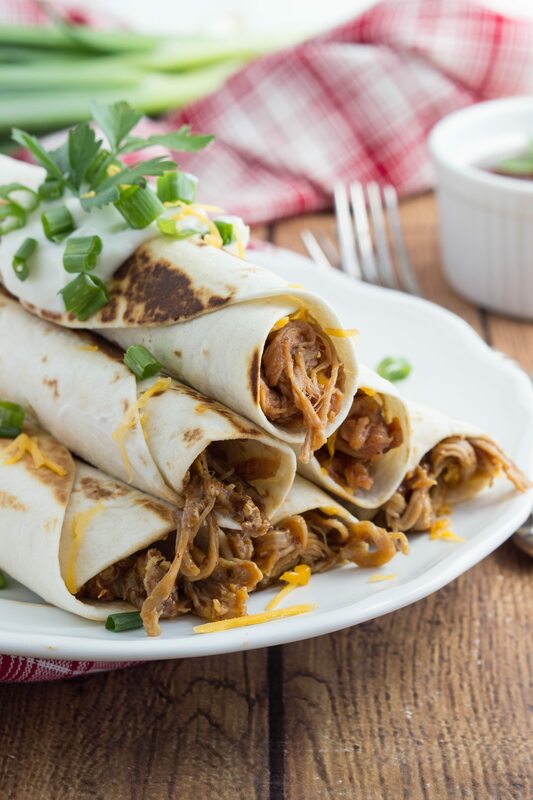 Optionally garnish with fresh cilantro. Also, this is such a great meal idea that my picky brothers would adore! It looks delicious! I TOTALLY would have loved this as a kid. I mean, I’m pretty sure I would love it now, but definitely when I was a kid. 🙂 We grill tons of food at my house, and I do really loved grilled hot dogs because of how quick and easy they are. 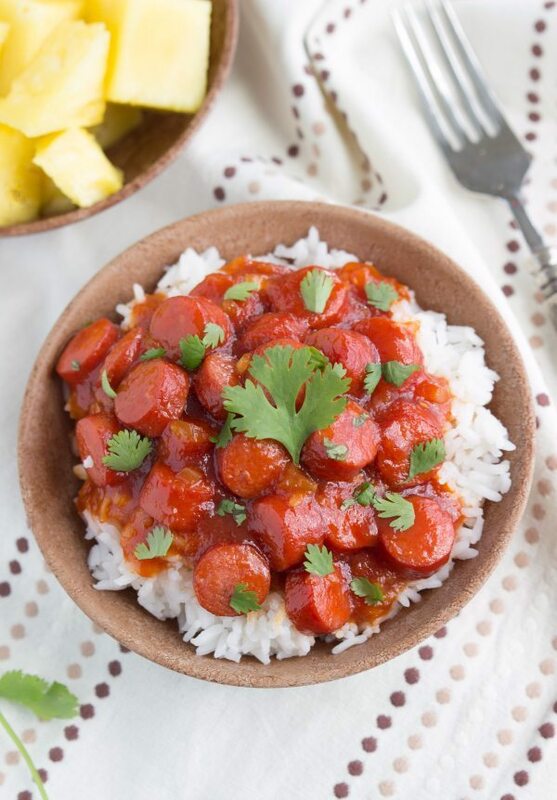 I’ll have to try them with this bbq sauce and rice some time! This is a great idea! 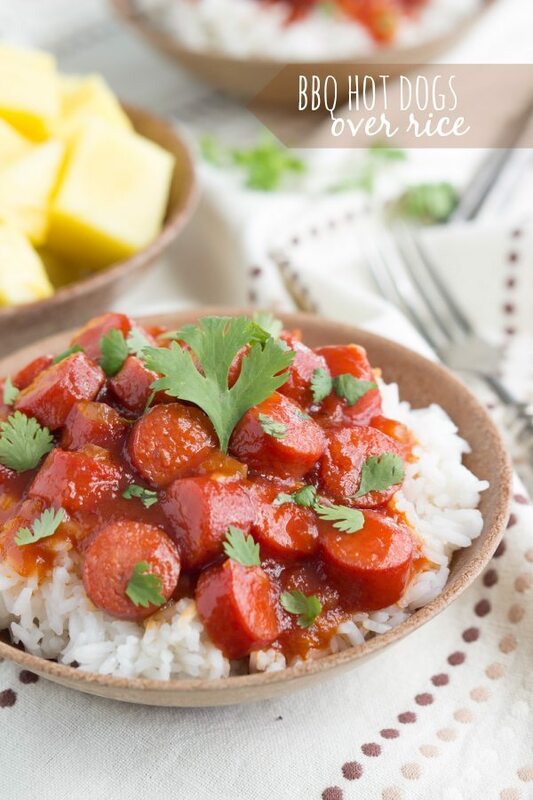 One of our favorite family meals is Sausage and Red Gravy over rice. My kids would totally love a hot dog version! Pinned! My wife would totally be all over this dish! She loves loves loves hot dogs… I’m thinking I need to make this for her! I want this for dinner tonight! YUM! I make my own recipe of baked bean and low-fat hotdog casserole with some yelloe mustard and BBQ sauce from a bottle not homemade and I bake it for about 30-45 minutes on 350 degrees and it’s very good! Smile. I think this sounds and looks delicious! 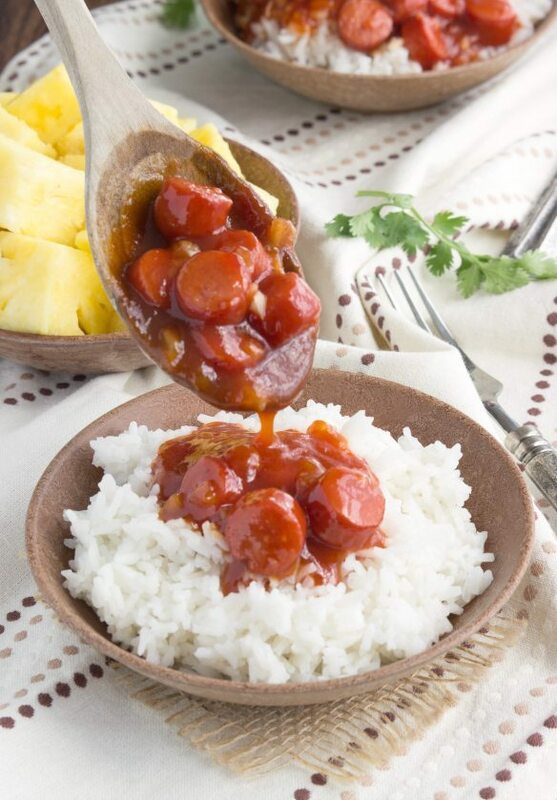 You can’t go wrong with hot dogs and BBQ sauce! Ever! Hubby brought home a case of frozen dogs one day last fall and we are still eating them. Thanks for giving me another option for cooking them. This looks great. I found you over at theTwo Cup Tuesdays link party. I host Tickle My Tastebuds Tuesday and would love it if you linked up this recipe. Here is the link http://bit.ly/1jlh94r. Thanks for this recipe ! I did it for my mom today and she loved it ! Amazing website , you have great ideas . You were right! 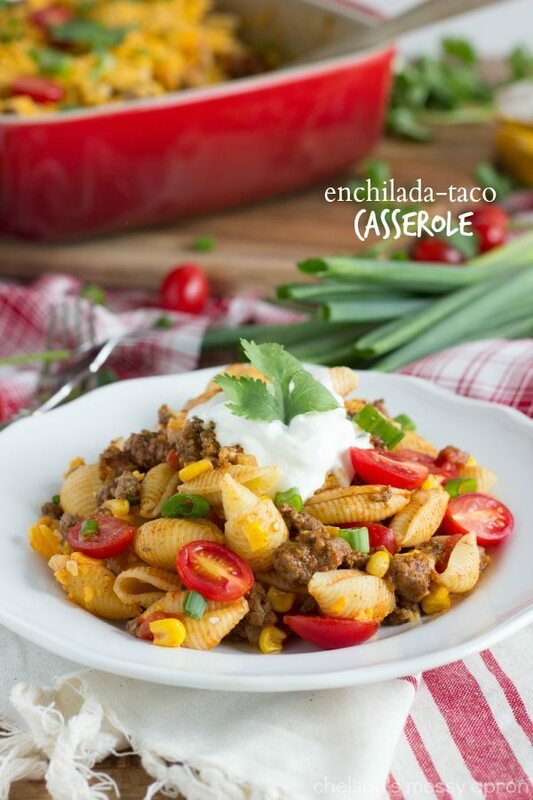 My children absolutely loved this recipe and my husband had three servings as well. Definitely bookmarking this. Thank you! I made this recipe today with veggie dogs. It turned out really good, will definitely make it again! It’s also really quick to prepare which I love. This is perfect for lunch. My son love it. As a 60yr old widower, I tried making this and was amazed at how cheap it was and how good it tasted. I am now addicted to it, 4 weeks later. Thank you. May God bless and keep you. May you be in heaven a half hour before the devil knows you’re dead. This is what the internet in good for.